Maxine Silva Health Magnet High School students now have a fast track to a Bachelor of Science in Nursing, thanks to a partnership between the El Paso Independent School District and Texas Tech University Health Sciences Center El Paso. Silva Magnet students who enroll in the program will be given conditional acceptance to the Gayle Greve Hunt School of Nursing’s Accelerated B.S.N. program. By taking prerequisite college courses while in high school, they will be on track to earn their B.S.N. in just 16 months after high school graduation. The partnership with Silva Magnet was announced last week. 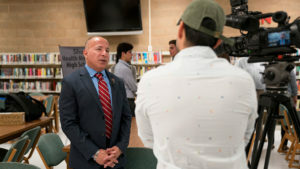 Silva Magnet, located on the grounds of Jefferson High School just south of the TTUHSC El Paso campus, is the second EPISD school to participate in the early-admission nursing program, officials said. Franklin High School on El Paso’s Westside began offering the program in 2018. Manny Santa Cruz, D.N.P., M.B.A., R.N., assistant dean and chair of undergraduate programs at the school of nursing, said participating students can take all of their required university prerequisites while in high school and earn an Associate of Arts Degree through program partner El Paso Community College. 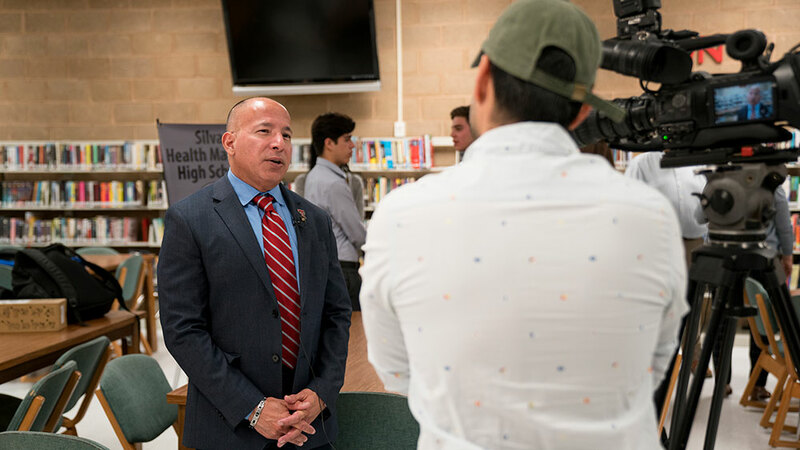 Manny Santa Cruz, D.N.P., M.B.A., R.N., assistant dean and chair of undergraduate programs at the Gayle Greve Hunt School of Nursing, spoke to the media during last week’s announcement of the early-admission program for Silva Magnet High School students. After graduating high school, the students begin taking junior- and senior-level university classes in the Accelerated B.S.N. program, which can be completed in four consecutive semesters (16 months). “Potentially, we will have students graduating with a B.S.N. at the age of 19-20 years old,” Santa Cruz said. Santa Cruz said the partnership helps TTUHSC El Paso address the nationwide nursing shortage. Silva students interested in pursuing the path to an accelerated B.S.N. would need to start taking the college courses during their freshman year of high school. The program will begin at Silva Magnet in fall 2019. The school of nursing is working to bring the program to high schools in the Ysleta, Canutillo, and Socorro independent school districts. “We have the whole city very interested in this opportunity for their students,” Santa Cruz said.